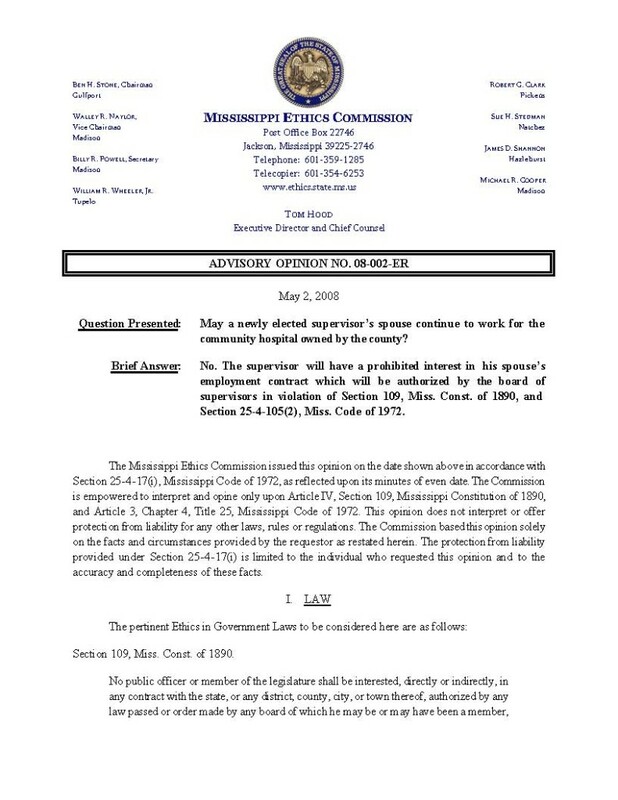 On February 1, 2019 the Mississippi Ethics Commission cited the Bay St Louis City Council for violating the Mississippi Open Meeting law in the matter styled Noonan v Mayor and Councilmen of the City of Bay St Louis. In what is a recurring theme with a different cast of characters, the City conducted an improper executive session which resulted in the removal of Ellis Anderson from the Bay St Louis Historical Preservation Commission. The opinion is not yet on the Ethics Commission website but I have seen portions of it. 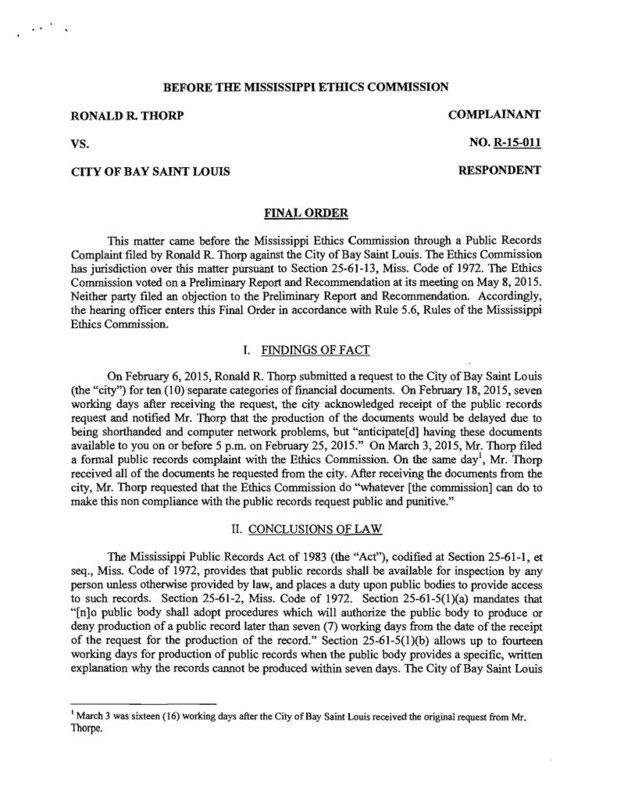 Essentially the Council and Mayor in the City of Bay St Louis are on the receiving end of an ethics compliant that mostly resulted from not receiving good legal advice from Board attorney Heather Ladner Smith, who failed to caution the Mayor and Council not to act on an item which was not contained on the official meeting agenda. Smith, the politically connected daughter of Hancock County Tax Collector Jimmie Ladner took over as City Attorney when Trent Favre was appointed County Court Judge. According to Mrs. Noonan, Ms. Smith of the Butler Snow law firm is providing legal services to the City without a formal written contract, a practice the previous administration was advised to discontinue by the Office of the State Auditor. While Slabbed gathers information to update this post, those so interested should click here for additional background. Earlier this month we did a series of posts on K-12 education, the last one disclosing a meeting Slabbed had with Bay-Waveland School Board Trustee Mike Bell. The meeting, which included local parent volunteer Cami Cornfoot and Lana Noonan, President of the Hancock County Alliance for Good GovernmentTM dealt with the hiring of a new Superintendent of Education and the optics involving the fact the new Superintendent’s Brother was the existing business manager of the school district. We covered a lot of ground over the ensuing two plus hours of discussing the state of the school district. I reserved judgment as I was in it for the information and I wanted to hear the School Board’s side of things. Lana on the other hand was pretty staunch in holding her position that the resulting nepotism from the hire of Vikki Landry looked awful. Simply put, Lana held Trustee Bell’s feet to the fire as they would eventually nicely agree to disagree on the subject. To kick start things we need to re-visit Cassandra Favre’s January 27, 2017 story, BWSD may need 2 assistant superintendents, which left her readers (myself included) with the distinct impression the School District’s Central office expanded by one Assistant Superintendent solely to ameliorate the problems created by hiring the sister of the business manager as the Superintendent. Trustee Bell took issue with that characterization saying the addition of the second Assistant Superintendent was a discreet event that was not done to solve the nepotism problem involving Landry but rather involved a more sweeping reorganization of the business office in a move that cut the amount of local funds spent on Administration. A bill removing a provision in the law allowing school districts to hire relatives of the district’s superintendents and principals passed the Senate on Wednesday. State law defines a relative as a spouse, child, sibling or parent. The bill would, however, put in place a process for spouses of superintendents to be hired. On July 10, 2015 the Mississippi Ethics Commission cited the Bay-Waveland School Board for improperly entering executive session to discuss the award of a professional service contract for architectural services on February 19, 2015. At that February meeting the School Board was advised it OK to discuss the contract award by Board Attorney Ronnie Artigues, who recently completed his 20th year providing legal services to the School District. The Ethics Commission found the discussion of a RFPs for a professional services contract did not meet any of the clear-cut criteria set forth in authority section 25-41-7(4) of the Mississippi Code. Worth noting is the school district, in response to the ethics compliant filed by Lana Noonan of the Hancock County Alliance for Good Government, did not actually claim to meet any of the exceptions set forth in the Mississippi Code, the compliance requirements of which Mississippi School Board members receive extensive training. Unfortunately the conduct of the public’s business in secret by the School Board also fits a troubling pattern of secrecy involving conduct of the taxpayer’s business with politically connected citizens dating back to the purchase of the Bay Tech Building by the school district for use as the Central Office. One of the School Board members that voted to enter the improper executive session, Board President Sherry Ponder, is a long time member of the school board that also holds an education doctorate. She faces at least two declared opponents this fall in the upcoming school board election in the City of Waveland including former Waveland City Councilman Mark Kidd. Another school board member, Maurice Singleton, is running for County Supervisor in District Four. Both have employment connections to the local newspaper of record, the Seacoast Echo. More recently, the School Board has voted to explore giving the cash strapped City of Bay St Louis fifty thousand dollars for use on a municipal sidewalk project off school property. According to Hancock County Alliance for Good Government President Lana Noonan, the request for the Attorney General’s opinion submitted by Board Attorney Artigues neglected to mention the district’s funding of the project would involve municipal rights of way that did not belong to the School District, an area of the law that is well settled based upon previous Attorney General opinions finding that Mississippi school districts have no statutory authority to fund a municipal capital project. It is a bit more complex than that however as this opinion from March 2012 demonstrates but the end result is ultimately the same. To the extent the facts in the 2012 opinion mirror Supervisor Cumbest’s fact pattern one wonders how it was missed by both the County and Hospital’s legal departments. By their actions SRHS has demonstrated a preference for keeping a law firm with major conflict questions involved in the pension litigation and using that firm’s support of Judge Harris’ opponent in last year’s election as a lever to force Harris off the case. The heart of the Harris recusal motion is predicated on that fact. Remove Dogan & Wilkerson from the equation and the Harris recusal motion they filed goes up in smoke. Simply put, the powers running SRHS must fear Judge Neil Harris more than they do their own legal conflicts. The implications of that fact are stunning and foretell a tale of major muck still being hidden. Once those documents are produced, my prediction is the SRHS pension plan’s law firm, Dogan and Wilkinson will not be long remaining on the case. So now we have Jackson County spending big money on the Laporte CPA firm while SRHS spends big money on their own actuary. The price of getting religion at SRHS sure is steep folks. In other news the fallout from Supervisor William Martin’s indictment and suicide continues. I have been told by sources in Jackson that the Martin indictment is related to the MDOC corruption probe. The timing of former MDOC Commissioner Chris Epps guilty plea and the Martin indictment are not coincidental in my opinion. Geoff, thanks for this article. What we are dealing with is an ELECTION YEAR. That is when any and everybody can get thrown under the bus, even the kids. The Bay-Waveland School Board hit a home run again today in their efforts to operate under the same clandestine scenario that has become business as usual for them. At a special called meeting to interview potential architects for future projects, they chose to do so in Executive Session. Just another day in the state ethics board neighborhood…. With our last post examining the ethics of a local ethics professor generating such interest a second post on the general topic is certainly in order. IMHO one of the most thankless public service jobs has to be as a non political staffer at your local State Ethics Administration. Both Louisiana and Mississippi’s are fairly ineffective by design of the political class and indeed just a year ago the Mississippi Business Journal called out Ben Stone, chair of the Mississippi Ethics Commission for blatant double-dealing. Along those same lines it appears as if the Louisiana Ethics Commission is routinely neutered by the courts and/or the legislature but the folks at the Louisiana Ethics Administration has Mississippi beat by miles in the transparency department as a few clicks on their website gets you the meeting agendas in advance. Website like that are favorite of the journalistic class for good reason. So today I take a reader tip and click away and we find a clue that the insurance portion of what would become known as the Jefferson Parish Corruption Scandal is still percolating away as the various slow motion wheels of government grind, cuss and discuss Mr Scott Fontenot and Fontenot and Associates. Names such as Tim Coulon, Tim Whitmer, Wally Pontiff among others also occupy this general vicinity of the scandal. I’ll add that I have reason to believe the federal grand jury has also taken a look at Fontenot so there is a reasonable basis to surmise he may be in bigger trouble than the potential $210,000 in fines plus forfeitures. 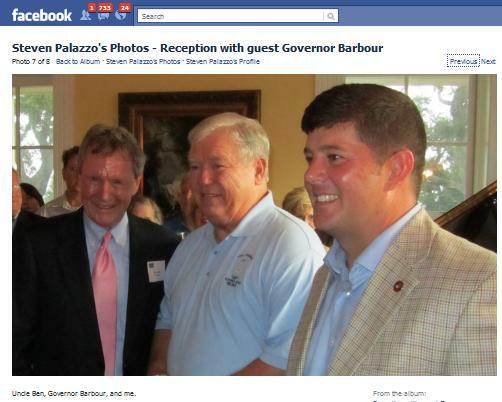 Author Douglas HandshoePosted on August 17, 2011 March 14, 2014 Categories SopTags Aaron Broussard, Ben Stone, District Attorney Paul Connick, IESI, Lagniappe Industries, Louisiana Ethics Administration, Mississippi Ethics Commission, Scott Fontenot, THT Group, Tim Coulon, Tim Whitmer, Trout Point Lodge, Wally Pontiff, Waste ManagementLeave a comment on Just another day in the state ethics board neighborhood….